Looking for a fun spicy side dish? To get more vegetables into your meals? Something grain-free? 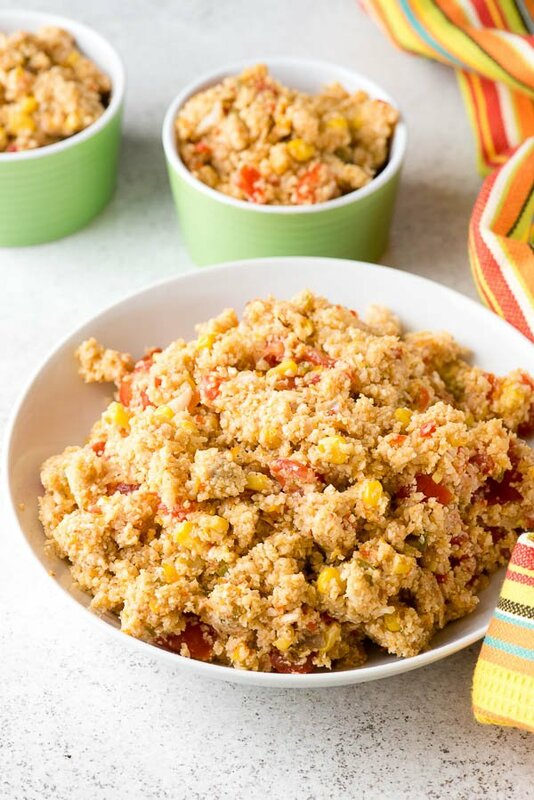 You’ll love the bold flavors, and easy of making Mexican Fiesta Cauliflower Rice. It is a tasty versatile side dish that pairs with anything and is fast to make. 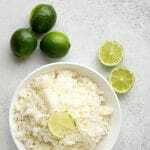 For any of you that follow culinary trends, search recipes online or are into low-carb eating you’ve undoubtedly noticed the trend of ‘cauliflower rice’. It’s exactly what it sounds like; cauliflower processed into pieces the size of rice or couscous. It’s a fantastic option for those wanting to incorporate more vegetables into their meals (or their kid’s meals), to create a lower-carb recipe in place of traditional grains, or to try something new. This recipe for spicy Mexican Fiesta Cauliflower Rice perks up the mild cauliflower with traditional Mexican flavors and instructs on how to make cauliflower rice from scratch. Plain cauliflower rice can also be purchased at the grocery store and substituted to make the recipe prep even faster. Last week I shared a mouthwatering Sicilian Cauliflower Salad recipe and had purchased some extra cauliflower when buying the ingredients. It seems a perfect time to break out a cauliflower rice recipe to share. One of my favorite flavor profiles (and my family’s too) is Mexican. I love the aromatic scent of cumin and it’s the one spice I constantly run out of so am using it often. Colorful sweet peppers, red onion, corn, jalapeno come together to create a feisty side dish. 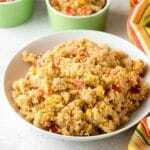 An obvious way to use the Mexican Fiesta Cauliflower Rice is as a side dish but it is also great in a bowl recipe layered with meat or burrito fillings and toppings. I served this with some grilled chicken shish kabob and I don’t think anyone realized it wasn’t rice. A classic question about cauliflower rice is ‘does it taste the same as rice?’ No it doesn’t, it only looks like it. 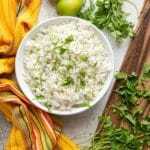 However, if you are a rice-lover, do give this recipe a try. It’s a great alternative to rice. And if you aren’t a cauliflower lover, never fear. The spicy, strong spices really mask any distinct cauliflower flavor! Cauliflower 'rice' is all the rage and there's no question why. It's a great alternative to traditional rice for those wishing for a grain-free option or to get more vegetables into their meals. The bold Mexican flavors make this recipe a favorite for everything from a side dish to main for building a delicious bowl recipe. Cut the cauliflower head into quarters. Cut off the bottom stalk, cut out any stalk inside the cauliflower head and break or cut into florets. Process 2-3 batches through a food processor processing the cauliflower into rice or couscous size pieces. TIP: doing this in batches ensures the cauliflower will end up uniform in size. Heat a large non-stick skillet over medium-high heat. Add the oil. When hot add the onion and sauté until translucent (about 5 minutes). Add the garlic and sauté 2 minutes more or until garlic is fragrant. Add the remaining vegetables and spices. Sauté to coat all the vegetables and allow to cook, covered stirring occasionally, until the cauliflower is cooked (about 5 minutes). Add salt to taste. Serve immediately. thanks for the sharing and your dish looks so yummy and beautiuful. so keep shared your idea and recipes…..! thanks for the post, your idea its really amazing and your dish looks is amazing and yummy. I will make it in upcoming days. I have always wanted to try making this myself but cauliflower is still expensive. I will wait a while until the price drops and make this Mexican Fiesta Cauliflower rice. Looks delicious! My boys would gobble this up in record time. I’ve never had anything like this before, but it sounds and looks yummy! I would definitely try this out! This looks so delicious! 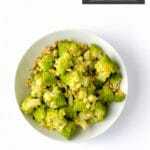 I am always look for more ways to add veggies to our meals, and this would be a great side dish. I am a big fan of cumin too! I think this would be a big hit in our house. I have everything right here to make this delicious dish! I never thought to put a mexican twist on the rice before! We’d love this! I really appreciate these recipes that you’re featuring lately! I love cauliflower rice because it’s healthy and it’s really not difficult to prepare contrary to what others say. I think this recipe is packed with flavor and is just SO good! I grew up eating beans or rice or both in a place and it’s always awesome find an alternative that doesn’t let me gain more weight. I think this is a must try, especially if you love Mexican flavors! I might have to try this, have heard of it but couldn’t work up the courage to do so. Not sure how kids will react to cauliflower instead of rice but is sure a great alternative to changing it up! I’ve never tried anything like this but it sounds amazing! I think my kids would even go for this. Gonna have to give it a try. I have recently discovered the glory that is cauliflower. I was leary at first but it’s so good! I haven’t cooked with cauliflower rice yet. I’ve heard about so many yummy recipes like this one. I have to try it! This is gorgeous, I never would have guessed it was cauliflower! I might actually LIKE it! Looks awesome! Wow, this looks so awesome! I was trying to think how I could get more cauliflower in my diet and this sounds like the perfect way! Mmmm that sounds really delicious. I’m definitely going to have to give this recipe a try. This sounds AWE-some! I love the healthy side while still having lots of flavor. I cannot wait to give this a try! We love spicy food. 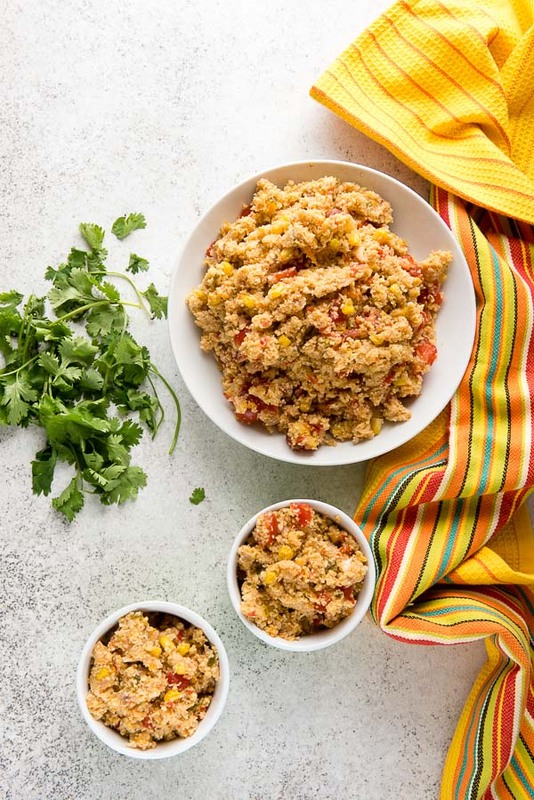 This Mexican Fiesta Cauliflower Rice recipe looks so good. I am excited to give it a try. I have been wanting to try cauliflower rice. 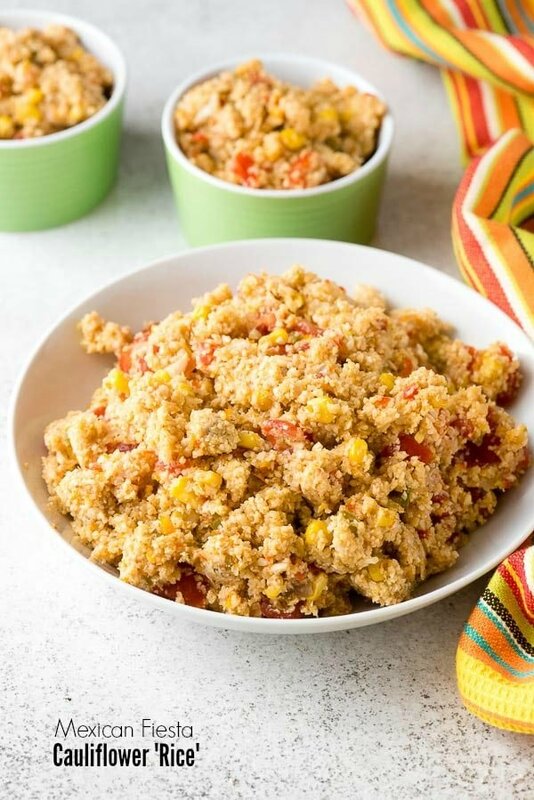 Mexican Fiesta Cauliflower Rice looks so delicious and easy to make. I will have to get the ingredients I need to make some this weekend. I am always looking for healthy recipes to try. 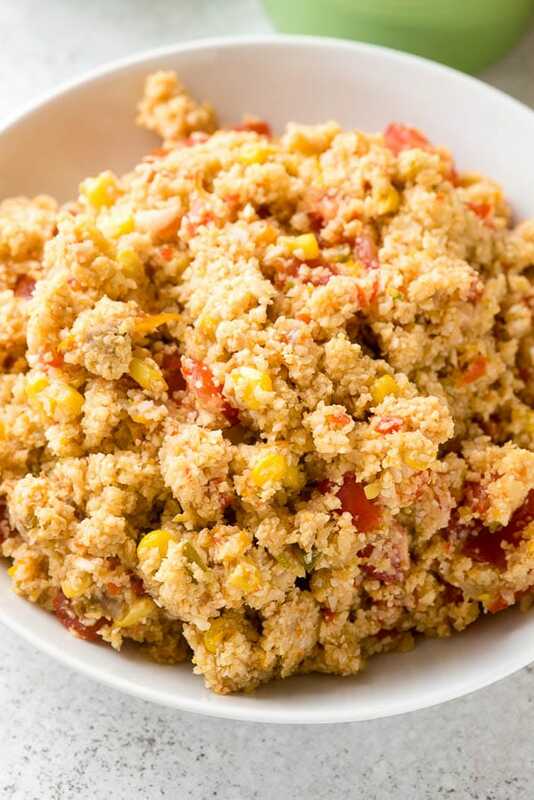 This recipe looks really easy to make and I really like that it uses cauliflower rice! It definitely seems like it would be very flavorful and delicious! I’m liking those spices and the heat from the jalapeno sounds really good. Making cauliflower rice would be awesome. Everyone in my house is going to love this! We actually love cauliflower rice more than actual rice, and we’re always ready for the southwester flavor! Om nom nom. This is right up my alley as a low carb option! I’ll have to try this! Thank you for sharing this unique recipe! This sounds really delicious. I am amazed at all the things people have learned to make from cauliflower. Thanks for the reminder to break out the food processor I bought to make cauliflower rice. I haven’t used it yet, but I’ve been meaning to. I’m a big fan of using cauliflower to make “rice”. I’ve only ever made it plain, but I think I’m going to give this recipe a try the next time I make it. It looks so flavorful!